(Host) Folk music legend Pete Seeger performed in Brattleboro and in Lebanon New Hampshire this weekend with a few very close friends. The famous banjo picker and singer-songwriter wrote or popularized such songs as "Turn, turn Turn," and "We shall overcome," which became the anthem of the civil rights movement. 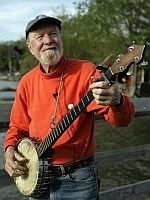 Seeger played the concerts to raise money for micro loans for New England farmers. Seeger also did his best to stir up awareness about the importance of local agriculture and the power people have when they raise their voices together. (Keese) Seeger is 89 years old. He doesn’t play many concerts anymore. He mostly sticks close to his home in upstate New York, where his touring riverboat Clearwater has drawn attention to the need to clean up the Hudson River ecosystem. But in the past few months he’s ventured farther afield, giving a few concerts in support of local agriculture. Travelling with him are his musician grandson Tao Rodriguez Seeger and blues artist Guy Davis, a longtime friend. This weekend’s shows will help Brattleboro’s Strolling of the Heifers organization offer loans to help farmers weather hard times or expand in new directions. Seeger says food production and distribution are huge global problems. (Seeger) But I’m now convinced that if we’re going to solve world wide problems we’ve got to solve them locally. In Brattleboro Friday Seeger sat between his two traveling companions and talked his music and his own approach to saving the world. (Seeger) I think we have a 50-50 chance of there being a human race here in 150 years.. But I tell people each one of us is a little grain of sand. If we throw our grain of sand in the right place, well who knows…. (Keese) Seeger said he never expected to become a musician. He wanted to be a journalist. (Seeger) I’d run the school newspapers from age 12 to age 18, first in one school and then another and then in college. But after I dropped out in my second year, I could not get a job in a newspaper. The Depression was on and I didn’t have experience or training. And meanwhile I had an aunt who was a schoolteacher who said, come sing some of your songs in my class, I can get five dollars for you. Five dollars? Just for having fun for an hour? It seemed like stealing. This was back in 1939 . (Keese) Pretty soon Seeger was making a living playing in schools and camps. He also played in Greenwich village with his group The Weavers. But when the children he’d played for went to college, Seeger went along with them. (Keese) Seeger’s music called attention to social issues from the dustbowl on. They questioned the morality of war and served as anthems for the civil rights movement and immigration reform. They got him in trouble – he was black listed and branded as a communist. And they won him the nation’s highest artistic honors. (Seeger) I fell in love with the old songs that people knew. They heard their grandmother sing some old song. And then I realized that it was this sense of participation that was important. So much of the modern life, you just sit back and receive. And TV is the extreme example of it. You receive a lot of crap and you’re being poisoned by thinking that life is just what you see on that screen. You might think of that as a radical thing but I honestly believe this world is going to be saved by people being active themselves and working with each other. Audiences at Saturday’s Brattleboro concert may have noticed that Seeger’s voice isn’t quite what it once was. But his power to get people involved is as strong as ever. (Keese) For VPR News, I’m Susan Keese. This week, State of the Re:Union travels through Appalachia. We’ll learn about mountain-top-removal mining through the miners and communities of West Virginia. In Kentucky, we hear a local radio DJ who’s gone from bluegrass and blues to Blackalicious, with an unexpected key audience.